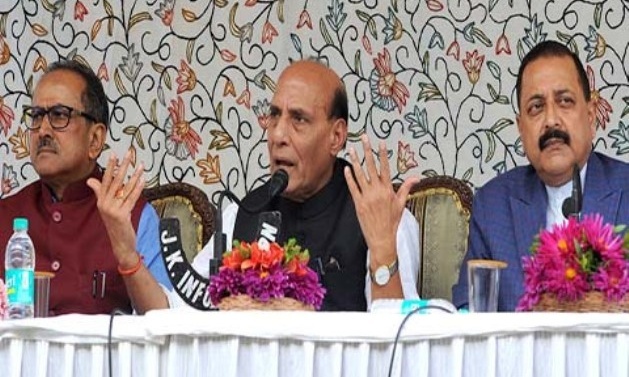 SRINAGAR: Union Home Minister Rajnath Singh, who is on four-day visit to Jammu and Kashmir, on Monday said the that five C’s—compassion, communication, co-existence, confidence-building and consistency—would form the basis for permanent solution to the Kashmir problem. He also termed his visit as a follow up to the Prime Minister NarendraModi’s assurance during his I-day speech that Kashmir issue can be resolved by embracing Kashmiris and reiterated his commitment that New Delhi is willing to talk to all stakeholders in J&K to resolve Kashmir. “It is our endeavor to give people of the state peace with dignity. We had talked about permanent solution (to Kashmir issue). I want to tell you that our permanent solution for Kashmir problem is based on five C’s—compassion, communication, co-existence, confidence building and consistency,” he said, addressing a press conference here before flying to Rajouri for second leg of his visit to the state. Winding up his three-day tour of Kashmir, Singh said that after his stay in Kashmir he can see that “trees of peace” haven’t dried up. “Amankaydarakthsookhaynahihain…I can see the green shoots of peace in Kashmir. That is why we had talked about permanent solution to Kashmir problem,” he said. 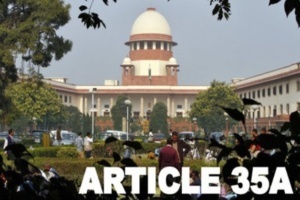 Though the Home Minister said the government of India was ready to talk to all stakeholders on Kashmir, he refused to comment on whether a formal invitation would be extended to Hurriyat leaders, most of whom are under house arrest or detention. During his three-day stay in Kashmir, Singh said he met 55 delegations including major political parties and civil society groups. After the meetings, he said he understands that the situation in Kashmir has improved. “I don’t want to claim that everything is completely fine but things are improving; this I can say with a firm belief,” he said. To a question whether Pakistan has a role in Kashmir resolution, Singh said the Modi government took “unprecedented steps” to improve relationships with the neighboring country. “But it wasn’t reciprocated. Pakistan is our neighbor (but) what is it doing? It is infiltrating terrorists to Kashmir. I want to tell Pakistan that this infiltration should stop. Pakistan is also involved in terror funding,” he said. For the past one and a half year, the Home Minister has visited Kashmir at least five times including his visit during the middle of the summer uprising last year when he headed an all-party delegation. “Not just five times, if there is a need to come I shall visit Kashmir 50 times. Whatever efforts need to be made for bringing peace and prosperity, I will do it. This is my firm conviction. By coming repeatedly here, the message is clear that we want to resolve Kashmir problem,” Singh said. While holding a security review meeting here on Sunday, the home minister said he issued instructions that children below 18 years should be treated in accordance with the Juvenile Act and kept in juvenile homes. “Many of them would have committed crime or mistakes first time after being provoked. But they shouldn’t be dealt as criminals,” he said. He said he suggested to Chief Minister Mehbooba Mufti to personally review this issue. “Those children should get proper counseling. I want to tell our youth to keep away from stone pelting,” Singh said. From his interaction with people, he said he could understand that people want to build their career through hardwork. “Terrorists have ruined many generations of Kashmir. We will not let another generation get ruined. The poor and hardworking people have been most hit by terrorism,” he said. On National Investigation Agency’s crackdown on separatists and continued raids in Kashmir, Singh the NIA was an autonomous organisation. “They must have got some information and they are working as per the law. But care should be taken there is no harassment of any innocent person,” he said. Singh said he visited Anantnag on Sunday and complimented government forces for their successes against militants over the past few months. “Everybody will agree that terrorists can’t be welcomed. They will be given befitting reply,” he responded to a question. “…I remembered Zohra (daughter of ASI Abdul Rasheed who was killed by militants last week). I’m not able to forget his face. We want to see smile and joy on the face of every young boy and girl here. This is our wish and we will continue to work in this regard,” he said. On the use of pellet guns in Kashmir, the home minister said the weapon was being used “very sparingly” now. “Last year we looked into the alternatives to pellet guns and introduced PAVA (grenades). Though it was not very effective, the pellet guns have been used less compared to earlier,” he said.